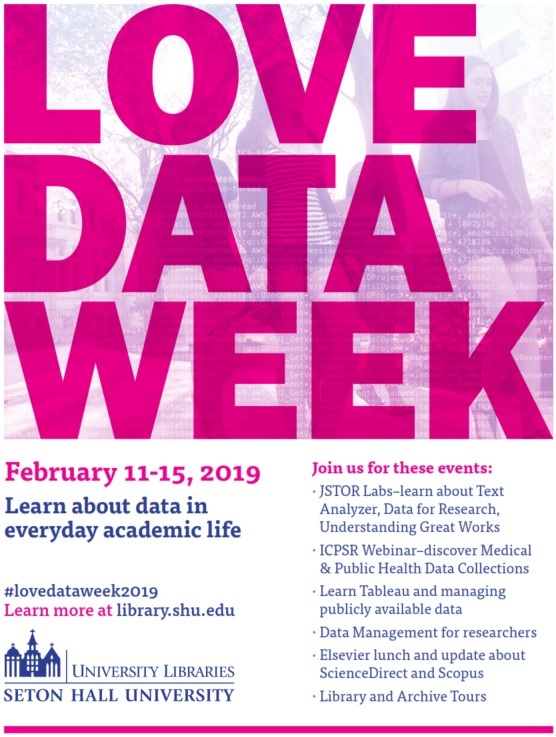 #SHU_Libraries We are pleased to announce Love Data Week 2019 will take place from Monday, February 11 to Friday, February 15! Learn about medical collections available through Seton Hall’s subscription to Inter-university Consortium for Political and Social Research based at the University of Michigan. Are you interested in learning more about data visualization? Curious about the best ways to tell stories with data? Looking for simple and fast ways to create data dashboards? In this beginner-level workshop you’ll get a hands-on introduction to creating interactive visualizations with Tableau Public, a free data analysis and visualization tool. Please bring your laptop to the workshop.